When it comes to hair, I take extra special care of mine because I keep it trapped under a scarf most of the time and it hardly ever feels any fresh air. Because of this, I think it’s best that I do what I can to ensure it stays healthy and my main tip: let it breath! Whether you wear a hijab or not, I think applying product after product to ‘protect’ it is essentially just damaging it more.. Like make up usually has layers and layers and we always ensure we remove our make up, we don’t wash our hair every night before bed (most people), so we shouldn’t bury it under hair products! I think we should keep our hair maintenance to a minimum and rock the natural look! All types if hair and hairstyles are in at the moment! If you don’t believe me, name a celebrity who has hair similar to yours? If you thought of one.. You have no excuse! The best type of compliment is when someone says you look good and you realise you made minimum effort! Now, we all have ‘bad hair days’ and that’s when a topknot is your best friend! Grab an old sock, cut off the toe, roll it up and make yourself a donut! We’ll be partying like its 1999! Oh yeah! I keep my hair care fairly simple but here are ALL the hair products I have.. Limited I know but to be honest I think I use 2 regularly and the rest on Eid (twice a year)! My hair is straight and fairly silky and doesn’t get greasy a lot. I wash it 1-3 times a week, depending on the occasion. It frizzes slightly after washing it and I never use heat on my hair. Despite the fact I get awkward kinks, I just work with them for my benefit. For shampoo, I’m a big believer to buy the cheapest one I can find! If I’m out and spot a shampoo that costs a pound, I’ll buy it because you only end up washing it out anyway! More than anything, really use your fingertips to massage your scalp and get rid of that grease on your scalp. No matter how many times I wash my hair, I’ll always use Head and Shoulders Anti- Dandruff at least once a week to ensure I don’t get flaky (especially when it’s cold- 80% of the time in London). At the moment I’m using this Herbal Essences uplifting volume shampoo.. It smells yummy! I like to condition my hair at least 3-4 times a month. The only reason I don’t condition every time I wash is because I think my hair would get greasy quickly! I’ve been using the S Factor range for 5 years now and I’m in love! I’m really loyal to their conditioner and if you have curly or damaged hair, this is your saviour! I use it because its so nourishing, creamy and makes your hair feel like a million dollars! When I use this conditioner, my hair knows just how to style better, look healthy and lustrous! I love it! 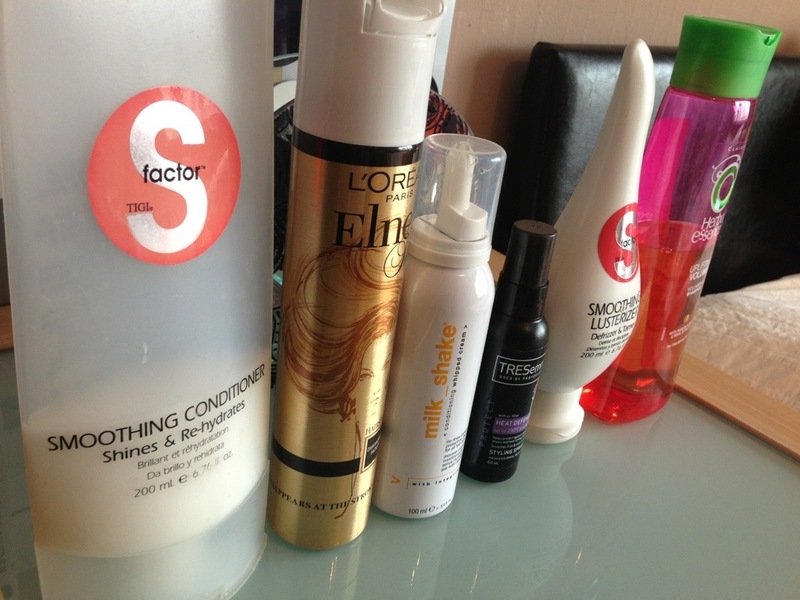 When I want a little pizazz in my hair and want it to look AMAZEBALLS, I always go to my S Factor lusterizer! This stuff makes your hair smooth, tames frizz and adds shine and gloss to your hair! You only need a 3-4 pea sized amounts and fun it through your hair and it’ll change your hair completely! It smells amazing and has glitter in it! I mean.. Glitter.. Really?! I’m in! When it’s winter and my hair is uber dry, or when I notice I’m getting dandruff, I run to my leave in conditioner. I got this Milk Shake one inside a GlossyBox but I love it and so did everyone I tried it on! It smells like vanilla-toffee-caramel heaven and is a mousse so, is really easy to work with! Apply a palmful of this into 80% dry hair and let it do its magic! Who doesn’t need a hairspray? And for me Elnett is the best! I love the Diamond hold because I think it’s the strongest. The hairspray hold really well but doesn’t get crispy or dry and should you need it to, combs straight out! It’s a godsend for those of us that love a bit of back combing and style holding!